NEW DELHI (AP) ― India is scrambling to protect its beleaguered tiger population after several big cats tested positive for a deadly virus, experts said. 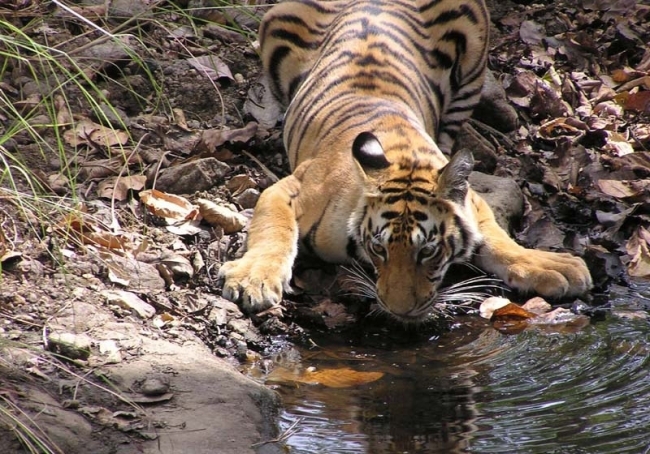 In the last year, canine distemper virus, common among dogs, has killed at least four tigers and several other animals across northern and eastern India, according to Dr. Rajesh Gopal of the government’s National Tiger Conservation Authority. The revelation is bad news for wild tigers ― already endangered by rampant poaching and shrinking habitat as India undergoes breakneck development to accommodate the staggering growth of its 1.2 billion people. That same economic development and population growth means more people ― and more dogs ― are coming even closer to wildlife. India will now test every tiger carcass it finds for the virus, Gopal said, while authorities also consider a massive campaign to vaccinate dogs against canine distemper. “We cannot vaccinate every dog, of course. But even 50 percent of dogs in the zones around sanctuaries would help,” Gopal said. He did not give details of the plans being considered. There is no vaccine for big cats. The cases being found across such a huge swath of India, however, suggests the disease could already be running in the wild, experts said, though they agree much more research is needed. Since two cubs tested positive in a zoo in the Bihar state capital of Patna a year ago, Sharma and his colleagues have found at least four more cases ― a red panda in the northeast state of Manipur, a wild tiger in West Bengal, a zoo lion in Darjeeling and last month a wild tiger in the Dudhwa Tiger reserve in Uttar Pradesh. “In the last case, forest guards said they saw the animal in a confused state before it died,” he said. Experts said there are likely more undetected cases, since testing for canine distemper has not been routine and few animals that die in the wild are ever found. Canine distemper virus, a close relative of measles, is associated mostly with domestic dogs though it has infected ― and ravaged ― other carnivore populations. It brought the U.S. black-footed ferret to the brink of extinction in the late 1970s. In Tanzania in 1994, an epidemic likely introduced by tourists’ dogs wiped out at least a third of the 3,000-strong African lion population in Serengeti National Park. The possibility of a disease like canine distemper hitting the world’s last population of wild Asiatic lions was a major consideration in last year’s Indian Supreme Court’s decision ordering Gujarat state to safeguard the species by transferring some lions to a second, faraway sanctuary. While dogs can often recover from the disease, other animals including tigers, lions and leopards suffer fever, seizures and delirium before they die. There is no known cure.